Arctic Circle Traverse 2013: Success! The work is half-finished. continuing a tradition of glaciology near the Arctic Circle on the Greenland ice sheet. 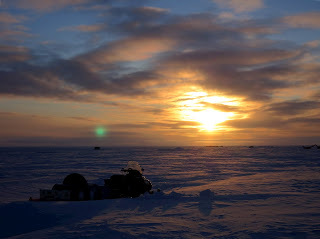 The name Arctic Circle Traverse (ACT) began in 2004 with McConnell, Spikes, Kyne; continued in 2010 with Forster, Box, Miege, Burgess, Gacke; in 2011 with Miege, Burgess, and others and continues in 2013. Success! The work is half-finished. I'm sitting at a tiny wooden desk as the midnight sun illuminates my window on the second floor of the KISS (Kangerlussuaq Int'l Science Support) station in southwest Greenland. I have trouble sleeping without the noise of wind--my second day off the ice and I still find the silence disconcerting--so I occupy my waking hours wading through a month of backlogged e-mails. 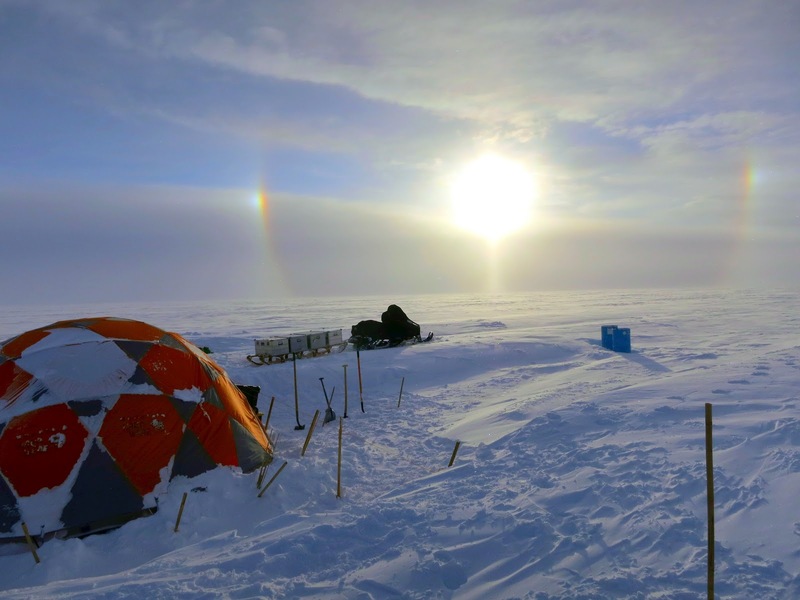 A recent press release from my parent institution CIRES announces the results of a recent study by a fellow colleague and friend, Dan McGrath, who states that Greenland's dry snow zone will likely disappear within the next several decades if current warming continues. It's a result not unexpected to glaciologists here. Among other things, he notes that "more work needs to be done to untangle these impacts." Greenlandic weather threw us seven innings of curve balls this field season, but as I pore through pictures of our past month's foray, I find myself a bit amazed at the richness of the data set we accumulated under even the worst of conditions. 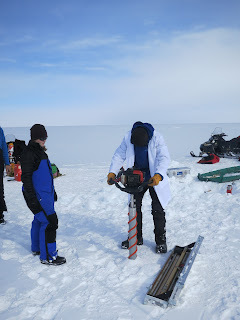 Over a dozen logged, measured and sampled firn cores. A hundred and fifty kilometers of continuous high-resolution GPR (ground penetrating radar), ready to process and uplink to a coincident and vast airborne dataset. An entirely new suite of stations transmitting data to improve satellite mass balance measurments... just to name few. 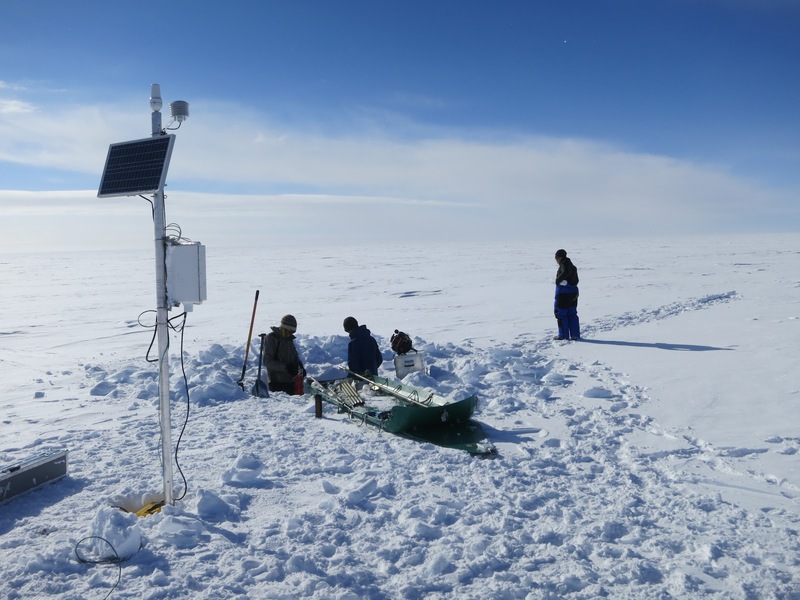 Every core we pulled up and every radar profile we collected points to unmistakable rapid changes happening in Greenland's snow and ice at every elevation we visited. We see it. We know it. But right now it's as if we're the only ones who do. The work isn't done yet. Samples need to be analyzed, core densities digitized, radar algorithms written, processed and calibrated. Plots need to be created, maps generated; results submitted, reviewed and published. We realize we still have as many questions as we do answers, and we're already discussing the needed foci of future campaigns (funding proposals need to be written and submitted, campaigns planned, logistics organized... rinse and repeat). 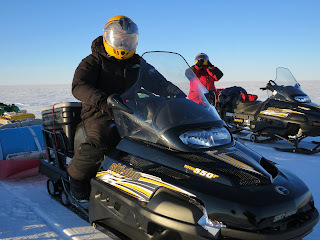 But even a tireless scientist finds time to breathe, and with our science cargo returning from the ice tomorrow at the earliest (precluding a day of sorting, drying and repacking), we were able to take a welcome rest day in Kangerlussuaq. A short hike this afternoon found us staring at a small herd of muskox, two of them butting heads in displays of dominance before grazing again on the shores of an Arctic lake. Even as the implications of our data burn an impatient hole in my mind, I can't help but smile at the beauty of one of the world's greatests wildernesses just a stone's throw outside of town. For much of the rest of the year we'll be neck-deep in stratigraphy profiles and radar traces. But today I'm just a lucky man on a sunny Spring day in Kanger. As soon as my plane touches down in Denver next week, the real work will begin. Horst at -39°C. 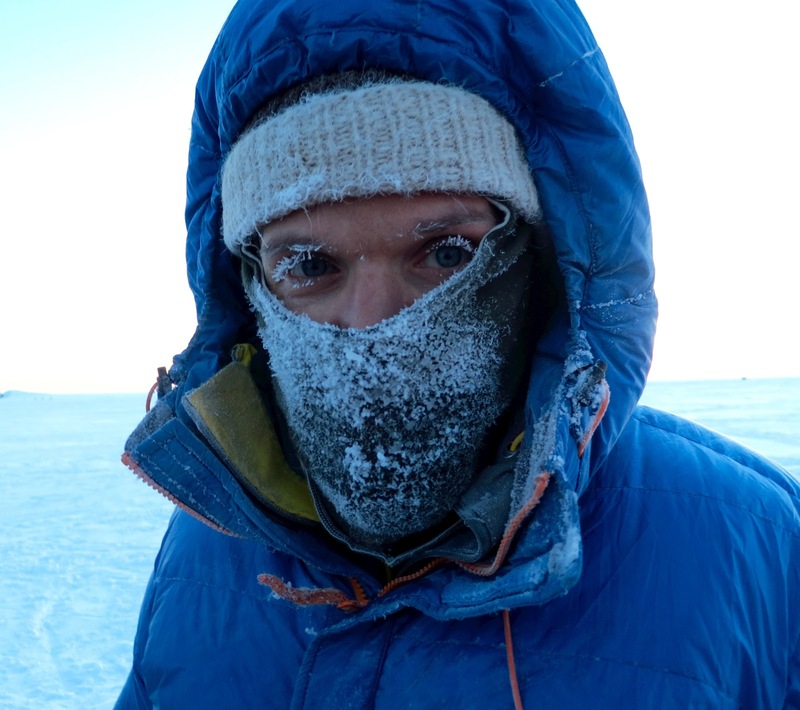 The moisture of our breath froze instantly to any surface it could condense. Sled packed at 10pm, Dye-2. Voltage testing a field-repaired GPR battery pack. A mistake with a Skidoo ripped out a cord and blew an internal fuse, causing half a day's delay to rewire and short-circuit the unit's internal electronics, keeping it running until trip's end. 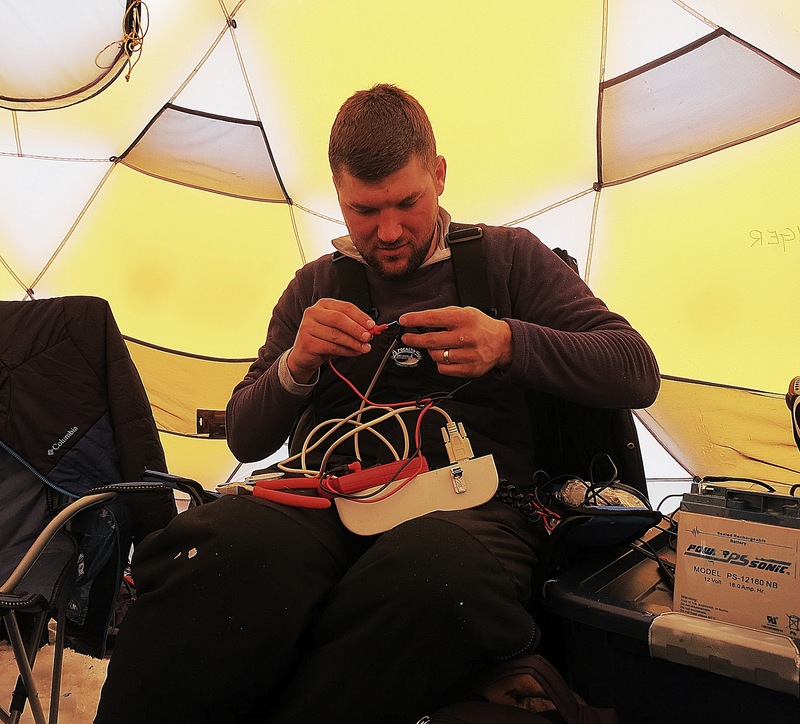 A successful polar field scientist is equal parts mechanic, electrician, cook, ditch-digger, janitor and survivalist. 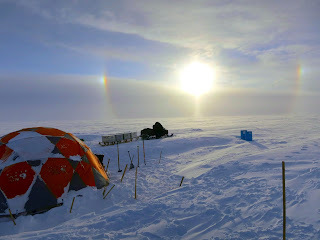 Sun halos at Camp-2 after a storm clears, 60 km NNE of Dye-2. Alex starting another core at 2350 m on our first fully-sunny day in 2 weeks, day 27 of the trip. The lab coat is a tradition among University of Colorado field geographers, wearing it for photo ops in our working environment. Logging stratigraphy from a 10 m core at 2350 next to a newly installed Firn Compaction station. Traversing to Dye-2 on a glorious clear evening, Day 28. Gear packed and ready to go at Raven Camp. Day 29. Koni Steffan's twin otter plane arrived moments later to carry us off the ice. 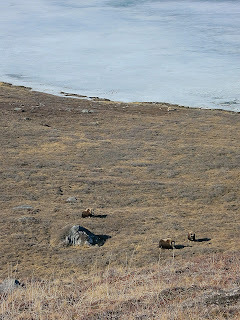 Musk-oxen near an unnamed lake during a dayhike after trip's end, outside Kangerlussuaq. 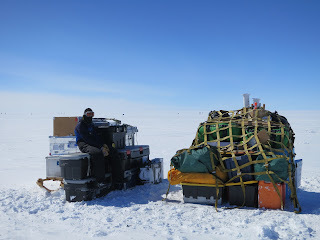 Working in the area of "Camp-2"
"last 4 days permanent storm"